The second to last state in the high school championship track series is Wisconsin. I have previously posted this track at Roger Harring Stadium at Veterans Memorial Field Sports Complex, but since UW-LaCrosse is my alma mater and I know firsthand what a great facility this is, I’m going to post it again! This was a nice facility when I went to school here, but starting in 2008, a complete renovation was started. The new track surface was installed, along with artificial turf. The stadium itself was also torn down and completely rebuilt. It officially opened again for competition in May of 2009. The result is spectacular. At the NCAA Division III level, UWL is a national powerhouse. The men’s team was again this year’s outdoor national champs. It was their 12th national title since 1988. They have also finished runners-up five times outdoors. They were this year’s indoor national champs as well, bringing their indoor team championship total to 16. Since 1983, the women’s team has won two national championships, and finished runners-up three times outdoors and three times indoors. In 1990, when I was going to school here, UW-LaCrosse pulled off what was considered a major coup at the time, and was able to secure the Wisconsin High School State Meet. For years, he meet had been held in Madison which is located just over an hour west of Milwaukee. With the majority of the state’s population located on the eastern side of the state, this was a good location. LaCrosse, for those who don’t know, is located on the far western side of Wisconsin, right on the Mississippi river across from Minnesota. To move the high school state meet here was not something that was expected to happen, but the team behind promoting this move did an incredible job. It has been so successful, that the meet has remained here ever since. And with the new stadium and track, I expect it to stay here for quite a while longer. Now to the facility itself. 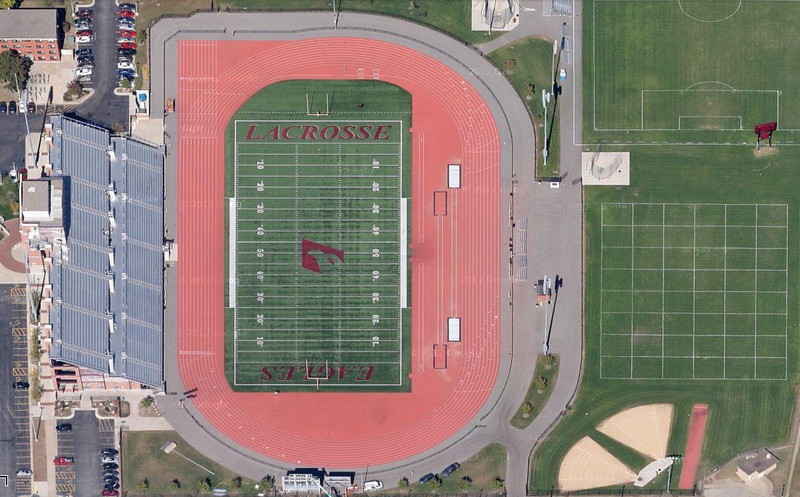 Because of the strong track & field traditional at UWL, and because it is the site of the high school state meet, this multi-use facility was designed with track & field in mind first. Yes, the Eagle football team does play here too, but notice how the football field looks like it was squeezed into the smallest space possible. The track curves are wide, meaning the infield width is also bigger. I like how the football field is offset and positioned closer to the bleachers, giving extra room on the backside for the jump runways. The throws are all located outside the track, but are across from the bleachers, so they can easily be watched from there. And in case you were counting, yes, this is a 10-lane track, all the way around! This is a top-notch facility. The bleachers can accommodate up to 6,500 fans, and the view from them is just beautiful with the bluffs in the background. The high school state meet was held here for all three divisions and May 31st and June 1st. Link to the results can be found HERE. A the NCAA Division III National Outdoor Championships were held here the weekend before that. HERE are the full results for both the men and the women. In addition to those big events, the Eagles also hosted the Wisconsin Intercollegiate Athletic Conference outdoor meet at this facility, along with four other regular season meets. This track gets a lot of use!